Remember a time when you looked at a painting or display in a museum and pretended that it spoke to you in some esoteric sense? 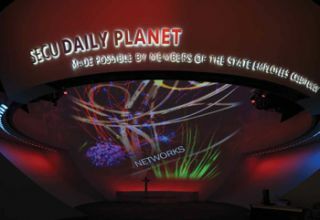 A 7thSense Delta server drives six Christie projectors in the SECU Daily Planet immersive dome experience at the North Carolina Museum of Natural Sciences in Raleigh, NC. Content was created by batwin + robin productions and the installation was done by Electrosonic. Now it really might, and then some. Interactive and gesture technology, with video displays, motion sensors, playback devices, and distribution equipment working together, is becoming ubiquitous in a wide range of museums across the country. Examples of how interactive exhibits are becoming more and more desirable can be found at a recent Technology Plus project for the new Colorado History Center in Denver, CO. Designed by Tryba Architects of Denver, the Center features exhibit design by Richard Lewis Media Group in Watertown, MA, and installation by AVI-SPL. Interactive exhibits include a virtual ski jump and a drive across the plains in a Model T.
Technology Plus designed an audiovisual system for the Center that can be reconfigured to support various spaces as needed such as a “panning for gold” demonstration where a local mic and speaker are used, providing audio flexibility for such types of short-term presentations. Multi-touch wall displays and tables are in almost every project Electrosonic looks at now. “They’re expensive, and size is the issue because they must accommodate multiple patrons, so price points must come down before smaller museums can afford them,” he said. MultiTouch, a Finnish company, has an LCD screen where the sensing is done from behind, not around the edges, Kidd said, so there is no additional bezel around the screen—it’s through the screen. The Kramer CORE is a family of three multi-format modular routers, the VS 1616D, VS-3232D and VS- 6464D, with matching input and output boards, including DVI, HDMI and dual-link DVI signal boards, as well as fiber and Kramer DGK at twisted pair input and output boards. The Voyager VG-Matrix 160 is a unique fiber-optic based matrix switch because of its considerable headroom— Voyager switching solutions can achieve 640 total ports— and the ability to configure any single port on Voyager’s eight-port I/O cards as an input or an output. The C3-540 series CORIOmaster system has 16 universal AV module slots available and the CORIOmaster automatically recognizes the modules inserted as either input or output modules. This allows up to 32 I/0’s, and since there are no dedicated input or output slots when using twochannel DVI-U or 3G-SDI modules, configurations can range from 30x2 to 2x30, and anything in between. The Enova DGX Switchers are a line of modular matrix switchers with a built-in controller that serve as the centerpiece of a complete integrated solution that manages and distributes analog and digital audio and video including HDMI/HDCP, control and ethernet. The Enova DGX digital media switchers feature AMX technologies SmartScale and InstaGate Pro to automatically solve HDMI and scaling headaches with plug and play ease; and without tools or workarounds. Crestron’s DM-MD32X32 is the largest matrix switcher available in the DigitalMedia (DM) product line. Designed for facility-wide and whole-house distribution, the 32X32—just like the DM-MD8X8 and DMMD16X16— is field configurable and card-based, with a variety of input and output cards from which to choose. DM accepts and distributes any combination of AV signals including VGA, HDMI, DVI, DisplayPort, 3G-SDI, ethernet, and US B keyboard/mouse control (for controlling a computer or other host device at a different location). The Atlona AT-HDDVI1616- AM 16x16 DVI and audio matrix switcher is HDCP compliant and offers three control options, nine programmable memory presets, and EDID learning. These and other features enable faster switching times in complex systems with multiple sources and displays. With resolutions of up to 1920x1200 or 2Kx1K, the AT-HDDVI1616-AM provides crisp video for presentations of all types. The MX430-101 8x8 HDMI matrix switcher can simultaneously distribute any input to any one output, all eight outputs, or any combination of outputs while maintaining full HDMI image resolution and signal integrity. Supporting computer sources up to UXG A and HDTV video sources up to 1080p, the new Altinex MX430-101 is fully HDMI V1.3 compliant for deep color with lossless digital audio. The Digital IQ Series KD-HD8X8BT HDMI matrix switcher transmits 1080p/60Hz resolution up to 400 feet and 1080p/24, 1080i, 720p and 480i/p resolutions up to 600 feet, when used with KD-CATHD500RX receiver baluns and CAT6STP1X. Blackmagic Design’s ATEM 1 M/E production switcher includes four SDI inputs, four HDMI inputs, analog input, and SDI, HDMI, and analog outputs, including down converted SDI and US B 3.0. Additional features include a complete frame resynchronizer on every input, as well as professional features such as stinger and DVE transitions, six keyers, multiview, builtin media players and more, all in a portable and compact two rack unit size with a free software control panel. The PDS series comes in three models—PDS-701, PDS-901, and PDS-902— and all models include one 3G/HD/SD SDI and four universal analog inputs. The 701 model features two DVI inputs and the 901/902 models have 4 DVI inputs. The PDS-902 extends the functionality of the switcher by adding a preview output. The analog and DVI inputs support the EDID 1.3 specification. With the PDS, users can capture and store up to three images that can be used as a logo source during a presentation. Built-in test patterns are also provided. Smart Edge is an edge blending system with universal analog and digital inputs and HD or high resolution output with full high resolution digital processing. Designed for applications requiring wide blended screens either horizontally or vertically, Smart Edge offers ten inputs, including two fitted with SD/HDSDI, and two fitted with HDCP compliant DVI. It outputs digital and analog signals in DVI, RGB, or HD YU V.
Extron XTP Systems provide a completely integrated switching and distribution solution for multiple digital and analog formats. They support local connectivity, as well as extended transmission capability for sending high resolution video, audio, RS-232, and ethernet up to 330 feet (100 m) over a single CAT·5 type cable. They are modular and expandable up to 16x16 or 32x32, and can be populated with input and output boards for long distance transmission when paired with XTP transmitters and receivers. The HDMX switchers switch, convert, and extend any input to any output. I/O can expand from 4x4 to 32x32 with modular cards (4 inputs/4 outputs): fiber with LC connectors (multimode to 300 m; single-mode to 10 km), DVI, HDMI, 3G HD-SDI, CAT5/6 (to 100 m), VGA, component, composite, digital, and analog audio. Eshkar is one of the three OpenEnded digital artists whose approach frequently combines three signature elements: non-photorealistic 3D rendering, the incorporation of body movement by motion-capture and other means, and the autonomy of artworks directed or assisted by artificial intelligence. Their artworks span a wide range of forms and disciplines, including dance, music, installation, film, and public art informed by creative new approaches to 3D projection. Presentations include the gestural 3D projection piece “Into The Forest”, commissioned by New York’s Museum of the Moving Image. A 22-foot Christie MicroTile wall with Vista Spyder X20 processing enhances the atrium of the Colorado History Center.A large wall in the atrium of the stunning new Colorado History Center begged for a media treatment, and received it in the form of a 22-foot-long Christie MicroTile display, both a backdrop for the historical montage of Colorado and a presentation display. Currently, there are several interactive Christie MicroTiles installations engaging audiences in non-museum sites, such as stadiums and higher education. One is at the Miami Dolphins Sun Life Stadium. Christie also is developing its own interactive applications, which will span many sectors including museums, sports, higher education, and retail.